If you have a BMW E46, E39, X5, and I think the E36 with climate control and your heater fan has a mind of its own it is most likely the final stage resistor that is causing the problem. In my case the fan stopped blowing, then after a day or two worked fine again for weeks, then stopped completely. Other people report the fan changing speed for no reason. The final stage resistor located just to the left of the clutch pedal on RHD cars. It is located in an awkward location but it is possible for you to replace this with no special tools. There are a couple of good guides on the internet to help you out. The first one I found on the Motormec website and it looks like it was originally an article from Total BMW Magazine http://www.motormec.co.uk/aircon.pdf, it gives a good introduction and a good overview. The second one is from the E46 Fanatics website and it is very detailed with some excellent pictures http://www.e46fanatics.com/forum/showthread.php?t=794644. This guide from Impee.co.uk has some very clear pictures but is not as detailed as the e46 Fanatics guide http://impee.co.uk/bmw_final_stage_resistor.htm. The tools I used were a ratchet with a short extension and a Torx t-20 bit, a philips screwdriver, and a torch. The most difficult part of the whole process is removing the top screw from the stepper motor because it is hidden well out of sight. If you rub your finger along the top of the stepper motor housing to the left of the stepper motor you will though feel the channel with the screw located at the end. It is the top left screw in this image. Here is a picture of the Final Stage Resistor also known as the hedgehog. It is BMW part number 64116920365 and it is probably worth shopping around for one as they can be expensive direct from BMW. 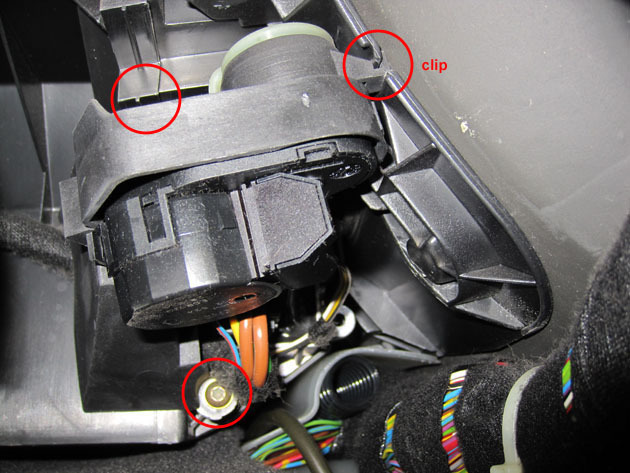 This entry was posted in Automotive and tagged blower motor, BMW 3 Series, BMW E46, climate control, final stage resistor, heater on 11/01/2012 by Paul. Thanks so much for this. Followed the links and managed to extract the FSR, and through other links took out the black rubbery gunge on top and resoldered the faulty joints. Resistance between pins on the top was no different before and after, but fan works fine now. If you can find a hex driver to 3/8″ converter and use a universal joint the job isn’t too bad – had it out in just over 35 minutes. A good description of the intermittent problems that I’ve been having on and off for 12 months – so good that I’m convinced that this is my problem on my ’98 525TDS, which up till now was one of those mystery probs that you’re reluctant to tackle because you don’t really know where to start! I’m doubly pleased because the job seems easier than anything that I thought it would end up being! The most annoying aspect of this problem was that fact that it would mainly manifest itself when the weather was either very cold or wet, when you need your heating and screen demisting, or very hot when you wanted your air-con! I did carry out a partial “fix” to having no blower by removing my pollen filters. This re-enabled “ram” air movement through the system as in pre-pollen filter days (and if you think THAT’S ancient, I can remember when car heaters were an “optional extra”!). So you’re awarded a “Nice One” for that info. Thanks. No burning smell the fan just stopped working. You could hear the stepper motor working when you switched to the windscreen demister. Hi, I am experiencing the same issues with my fan heater and A/C. other than the FSR (which could be the culpable part), is it possible that a fuse had blown? Any idea which one relates to the heating and A/C so that I can check and eliminate this as the cause. open your glove box, take out the cover, find the little map behind it, if im not mistaken for 2006 bmw 320d , check fuse number 6, 77 and 88. Hi, this sounds just like a problem i’m experiencing. At the beginning of the year my A/C Climate control started to make a “wiring” sound like a small fan still running (if the unit had been on) after i had stopped the engine after a drive. It would carry on for about 15 to 20 minutes. However, today the whole system seems to have packed up. The LEDS on the unit all work fine but its just not “blowing ” any air. No fan Noise, nothing….Any ideas? These Final Stage Relays seem to produce all sorts of weird symptoms, but I think the bottom line is that if everything seems to be doing what it should be doing, with the only exception being either erratic fan function, or NO function, suspect the FSR. Once it has been removed from it’s fitted location, turn on the ignition and the non-functioning fan and hold the FSR by it’s “spines”. These should rapidly warm up as they are actually a heat-sink. If they don’t warm up, you can be pretty certain that it’s knackered. Re. my earlier comments on how much easier changing the FSR (hedgehog) seemed to be than I was expecting it to be on my E39 (’98 525TDS), it should have actually been MUCH easier! Because I was following instructions for a different model (can’t remember which), I dismantled far more stuff than was necessary! Even the hedgehog itself only required me to lift a plastic “flap” which acts as a spring clip/retainer in order for me to be able to remove it. I reckon that on my model, the whole job could have been completed in 10 minutes. Add to that the fact that the price of the hedgehog off eBay was only 19 quid and it ends up being almost painless! Here is the history of my symptoms: Yesterday morning after starting my E46, I had no heat – A/C blower. The compressor came on with the AC button, and all of the controls seem to be ok, but no blower. The first time I turned off the ignition, THE BLOWER CAME ON FULL BLAST AND CONTINUES TO RUN INDEFINITELY! I have to disconnect the battery to stop it. When I reconnect the battery, it comes back on, and it blows cold/hot air via the heater console, but with no control over the blower speed, which blows full blast no matter what level the blower control is at, and again, when the control is turned off AND even when the car is turned off. Is this a FSR thing too? Thanks! This is beautiful. It’s nice to know that people are still into these kinds of beauties. I got my BMW from a guy in Greensboro. And I love it. It’s not a super rare classic model but it’s a start into the club. Many thanks for the very helpful info, I found all the links very useful. The hidden screw is a real pain being hidden quite a way out of sight but I got there after about 30mins and trying several different tools (long and thin was the answer). New piece fitted and now the fan works correctly. I have a 2000 320d E46. My fan stopped working and i bought an FSR as i suspected this was the issue after seeing loads of reports online. But when i stripped out all the bits in your description I cannot find the FSR. IS the FSR only on models with air con? Its looks like my motor and other bits are set up differently too. The final stage resistor is on cars with automatic climate control. 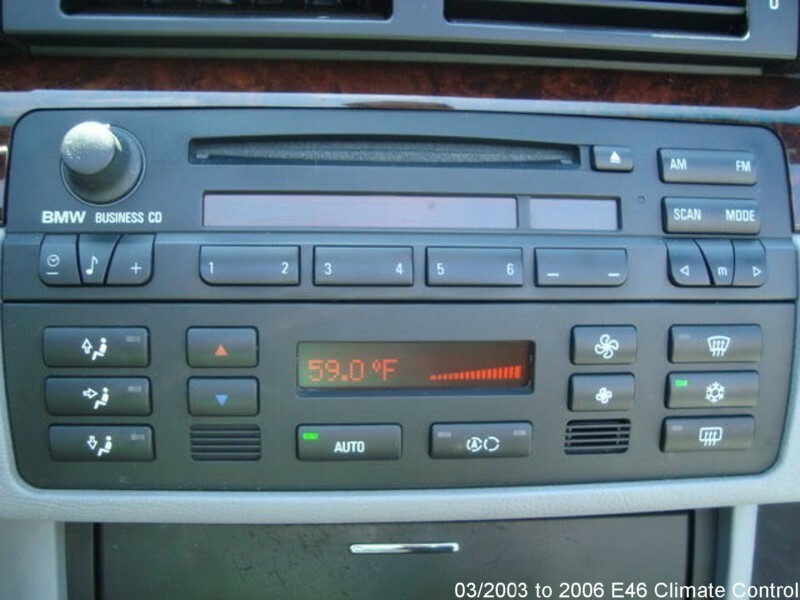 so if my car has manual oldfashioned heater control unit with turning knobs then it wont have the fsr? I’m confused because I have put the never digital air con unit and next day found the car battery being total dead.I know its guaranteed because it has happened twice when I tried to replace more modern looking air con unit to digital from manual./But I don’t understand why and what its causing? Reading through all the comments here, I think I need to replace the FSR on my 2001 E46 Coupe. I know that if I attempt a replacement myself I’ll get nothing achieved & totally wound up, (ha-ha). Does anybody know how much BMW would charge to supply & fit a replacement? Or should I buy an FSR off ebay and get a local garage to give it a go? Thanks , Marco in Ca. My blower motor blows hot air, in the summer, temperature dialed to 59, with climate control set off, auto Mode off. Have a 00 e46 320d. Has all the symptoms of above posts but I have the twist knob controls, any ideas on what parts I need? hey mate have exactly the same issue,mine is 04 318ci facelift but oddly enough its got installed manual control air heating unit which I hate because it looks so out dated.,So when i tried to replace to digital air con unit,next day my car battery was total flat.When changed to manual air con problem has never happened again,got another never year air con unit and tried it again to digital,and battery was flat again.WTF,did you manage to sort out or found any ceratin fault please? cheers if you can reply. Here is the historyofmy symptoms: Yesterdaymorning after starting my E46, I hadno heat – A/Cblower. The compressor came on with theAC button, andall of the controlsseem to be ok, butno blower.ThefirsttimeI turnedofftheignition, THEBLOWER CAMEONFULL BLASTANDCONTINUES TO RUNINDEFINITELY! Ihaveto disconnect the batteryto stop it.WhenI reconnectthe battery, it comesback on, anditblowscold/hot air via the heater console, but with no control over the blower speed, which blowsfull blast no matter whatlevel the blower control is at, andagain, whenthe control is turnedoffAND evenwhenthe car is turnedoff. Isthisa FSRthing too? Thanks for Posting a Nice Blog.I also need it . I am facing same issue , My car heater is not working properly.